Jai is a BIG lapdog. The Weekly Photo Challenge asked that we write about what “Big” means to us. I chose one of my sister’s dogs, Jai. 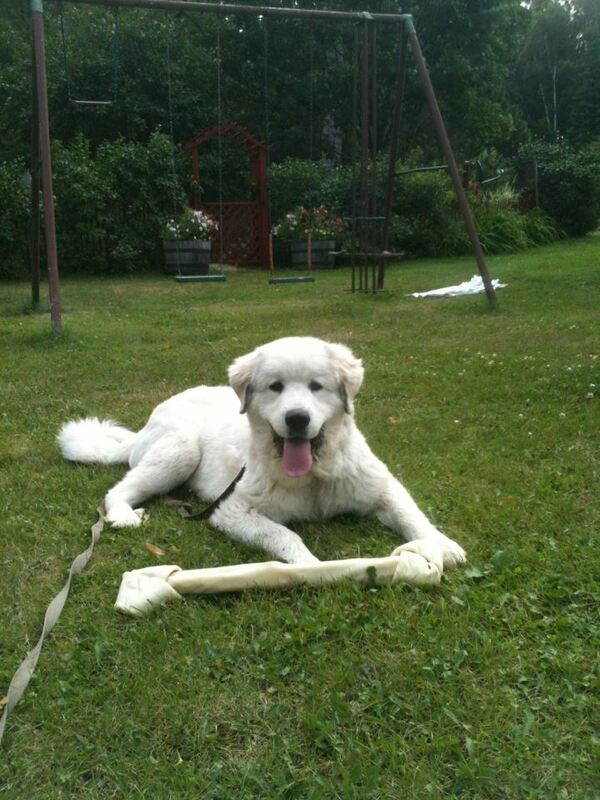 He lives at The Funny Farm and is a rescued Great Pyrenees PUPPY (14 months, 120 lbs). Jai is short for Ginormous, White, Slobbering Dog. Think puppy brain in a pony-sized body….He digs BIG holes, runs BIG laps, needs BIG toys, and cleaning up after him is a BIG job. 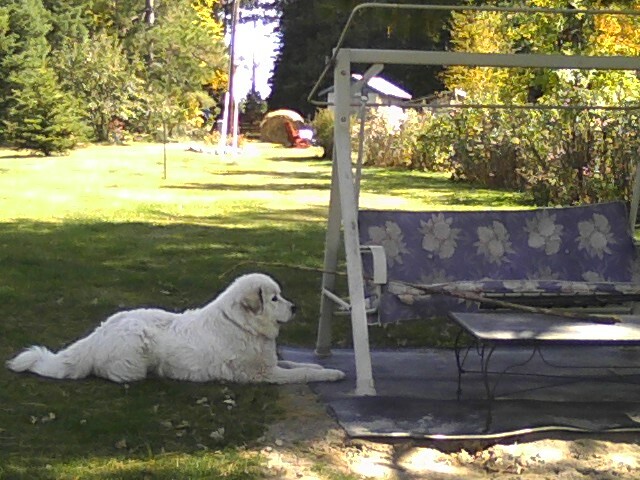 Great Pyrs are bred to protect livestock. 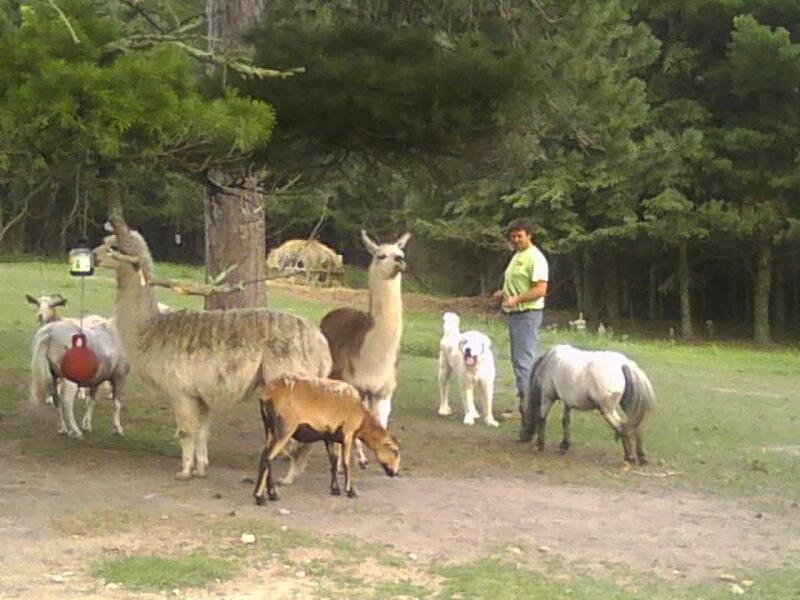 Lois is hoping he will help keep farm creatures IN the fence, and deer, coyotes and wolves OUT of the fence. 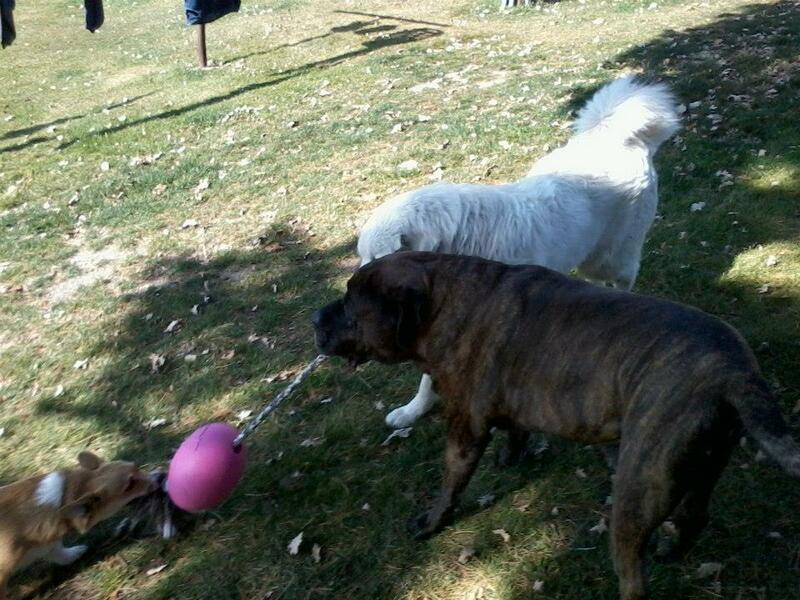 These dogs are mostly nocturnal , gentle with children, and love to roam their territory. They are working dogs, but Jai takes naps, too. He’s just a baby. He takes up most of the couch, and likes to snuggle in bed, too. Ginormous bone, purchased in the hopes of saving furniture. Normal dogs play with sticks; my sister’s dogs eat trees. 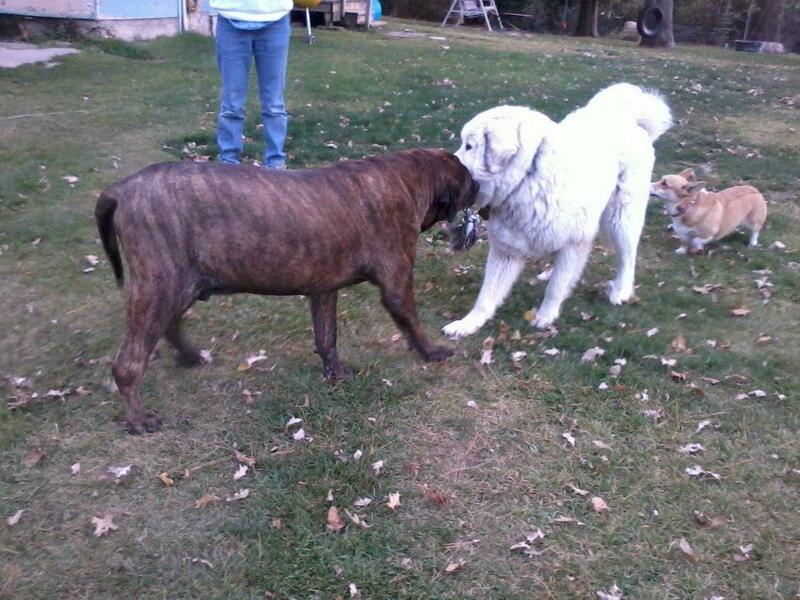 Mr. Stinky Droolface, the Old English/Bull Mastiff Grampa dog of the farm is actually bigger than Jai. Stinky weighs about 180 lbs, but at 10 years old is slowing down considerably. When he was a puppy we called him the Mastiffosaurus Wrecks. At one point my physical therapist recommended I stop visiting my sister until he outgrew the puppy stage. He kept knocking me over by accident. Of course Walli the Corgi refuses to be left out. She’s 6 months older than Jai, and one-tenth his size. And come to think of it, ten times the attitude. Size is relative. Walli Pajari-Williams goes to work every day with her mom, Lois, at Cook Dollar Barn , while Jai, Stinky, and GusGus take care of the Funny Farm. What breed do you think Lois needs next? What’s your favorite? For more details on these breeds, visit the links below. Your dog lives the life. 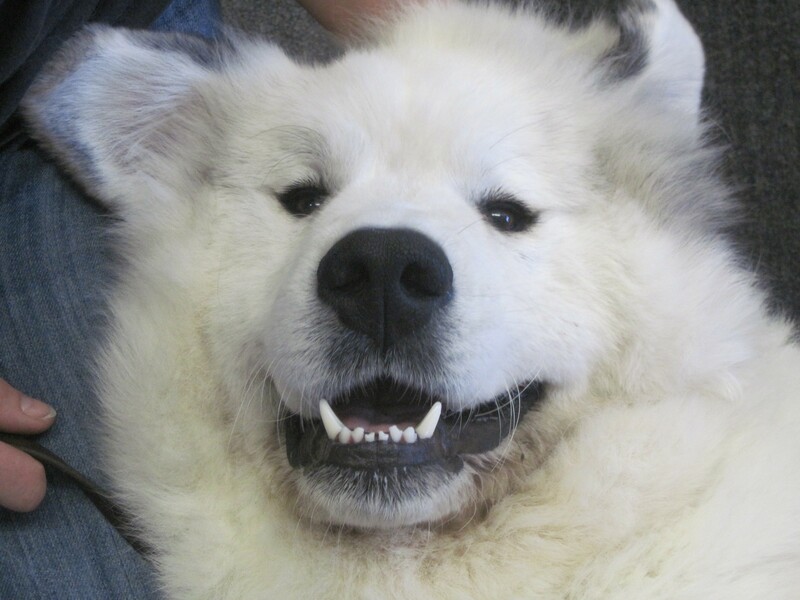 I actually freakin’ love pyreneese and my beau and I want one for our next dog…! They are so laid back and sweet! That’s why I want a pyr… Someday I’d like to move to substantial land and having a pyr would be a great asset to my animals. 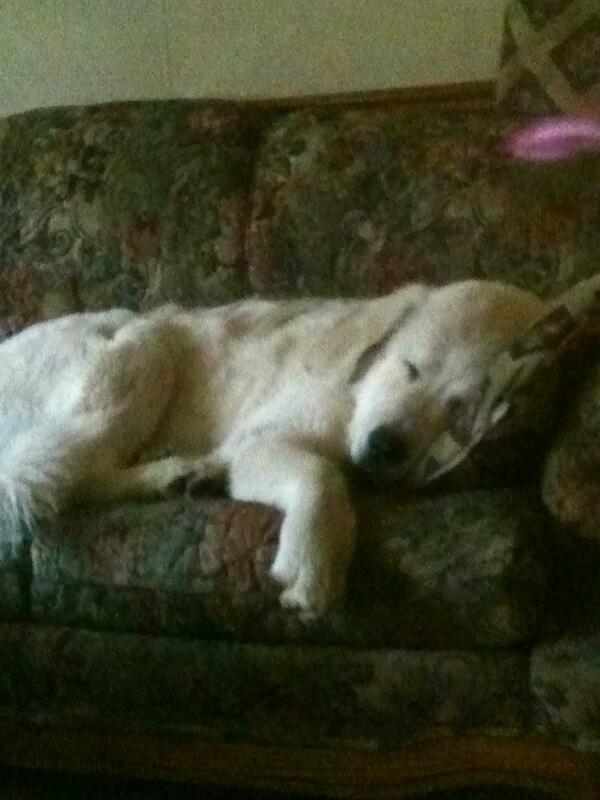 My beau just likes calm, fluffy, big, white dogs. Jai will get there! 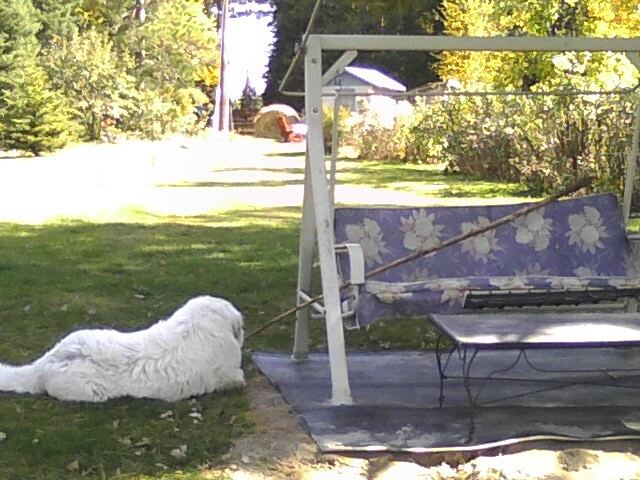 I have never met an adult pyr that was hyper or jumpy and I have met quite a few. Thanks bunches! I am glad someone does! And I think it’s awful. XD But it doesn’t matter… It will be replaced some day for-sure! I will pass your encouragement on to Sis… lol Jai is a challenge. When exactly will the puppy phase end?? And that’s what I always said about my last name, “it’s hard to pronounce, but I’ll change it someday anyway” PIE-ree.. Most dogs settle down 2-3 times in thier life. The first time tends to be between 8-14 months old. It’s when the dogs hit about a year, would normally start getting thier breedable heat cycles and are technically “adults” (in the same way a 16-year-old is technically an “adult”). The second time is around when they are finished doing all normal growth which is around 2-2&1/2 years. At that point they are on the biological and mental scale of a 26 year old perhaps… Old enough to know everything they need and be responsible in thier tasks but still very active. And the third time is when they start getting a little older around 5. But it’s worth noting that big dogs tend to be on the long end to mature… So you probably have more like half a year left to get through the worst of the puppy rather than two months!